GUAM stands for Georgia, Ukraine, Azerbaijan, and Moldova: four former Soviet states that are increasingly menaced by Russia. Indeed, Russia invaded Georgia a few weeks ago. These four countries have already formed the GUAM Organization for Democracy and Economic Development. Fortunately, the international community’s balancing against Russia is providing additional support for the GUAM states, both from Europe and the United States. “To the south, we have neighbours of Europe. To the east, we have European neighbours…they all have the right one day to apply [for EU membership],” Mr Sikorski said, urging the eastern countries to follow the example of the Visagrad Group set up in 1991 by Hungary, Poland, Slovakia and the Czech Republic as part of their EU integration efforts. “We all know the EU has enlargement fatigue. We have to use this time to prepare as much as possible so that when the fatigue passes, membership becomes something natural,” the Polish minister said. BRUSSELS, Sept. 2 (Xinhua) — The European Union (EU) is to launch the Eastern Partnership to boost ties with its eastern neighbors by the end of the year, an EU commissioner said here Tuesday. Benita Ferrero-Waldner, commissioner for External Relations and European Neighborhood Policy, made the announcement at a joint press conference after meeting with Georgian Prime Minister Vladimir Gurgenidze. The Eastern Partnership, proposed by Poland and Sweden and approved at the EU summit in June, would cover countries including Georgia, Ukraine and Moldova, she said. “We will have to see how far we can go. There should be greater economic integration, more mobility and more tools to help solve the security situation and resolve frozen conflicts,” the commissioner said. Under the partnership, the EU will enhance regional cooperation between these countries and open bilateral negotiations with each one of them on a visa regime and free trade areas. The EU is expected to make decisions on such a partnership, an extension of the European Neighborhood Policy (ENP), in late autumn or by the December European Council, according to Ferrero-Waldner. As he starts a tour of Georgia, Azerbaijan and Ukraine, Mr Cheney will try to allay fears that Russia’s campaign in Georgia has fatally damaged a cornerstone of the West’s energy policy. That message will be particularly potent in Azerbaijan’s capital Baku, once the capital of the Soviet oil industry and now a pivotal ally of the United States. More still needs to be done. We need peace with Iran and we need to use more countermeasures against Russia. It’s starting to look like GUAM is a Seam State organization between the Core and the Russian Gap. 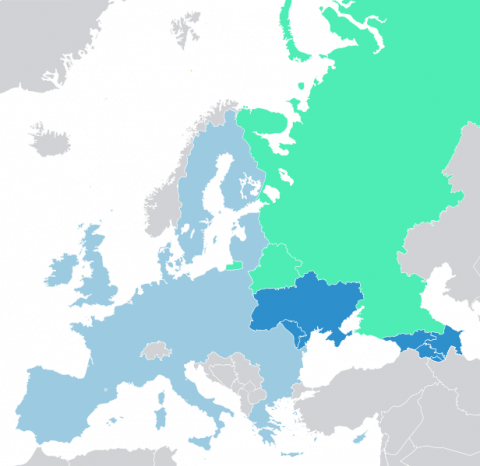 The European Union is a combination of the Old and New Core, Russia is Gap, and GUAM / The Eastern Partnership is a set of Seam states. GUAM is rapidly importing Core rulesets on labor, the economy, and politics. If Russia’s invasion of Georgia and subsequent recognition of Abkhazia and South Ossetia speeds the loading of GUAM into the New Core, then it will have been a very good thing. Relatedly: The Eastern Partnership also includes Armenia, a Russian client state. Still, the EU may be trying to repeat the success of the Visagrad group  (which now forms the heart of New Core Europe), which contained Slovakia in spite of some arm-waving by the Slovak government. The pattern seems to be that the EU thought it could wage a ‘5GW’ in which the benefits of connectivity to the EU by a small state naturally subvert the actual political orientation of the small state’s leadership.